Piping Systems, Inc. is in the business to provide you with quality conscious fabricated piping assemblies (spools) in accordance with your project specifications and the associated codes governing their design and operational licensing. Our core focus is on assembly accuracies, superior welding quality, on-time sequential deliveries, true-fit field installations, and building relationships that provide sound repeat business success for both partners. Piping Systems, Inc. is a union pipe spool fabricator signatory to the United Association of Journeymen and Apprentices of the Plumbing and Pipe Fitting Industry of the United States and Canada, Local 400. 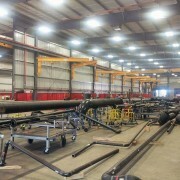 Our fabrication facility is located in Hortonville, WI and is strategically located to deliver your fabricated piping assemblies to anywhere in the US and Canada at competitive pricing and for the favorable “lowest total installed cost”. Our contract also includes a “no strike” clause to insure the commitment to meet our contractual obligations at all times. Associated with our Local 400 UA membership, Piping Systems, Inc. is in receivership of the finest trained UA craftsmen in the USA. The Local 400 training center program along with the instructor training received at Ypsilanti, MI, is the flagship UA training center in the USA. One of the programs that Local 400 specializes in is the modified training of craftsmen solely in the manufacture of shop fabricated piping assemblies as a dedicated and focused career. In lieu of the traditional training program, they go through a specialized apprenticeship program that teaches them specific techniques used in shop fabrication thus becoming a journeyman “Fabricator” classification that is committed solely to the shop fabrication environment. 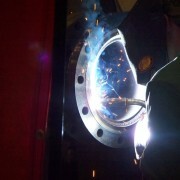 From this, you are assured of the finest and most consistent quality workmanship in the pipe fabrication industry. Additionally, the repeat business that we receive on a consistent basis is a reflection of our customer’s appreciation and recognition of the work ethics, positive attitude, and attention to detail that goes into every pipe spool built by these craftsmen.